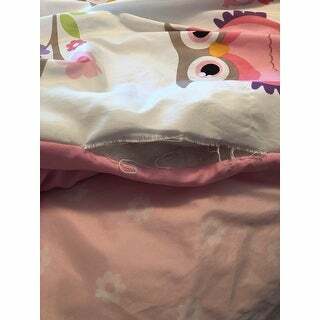 You'll get a hoot out of the Mi Zone Kids Noctural Nellie Complete Bed and Sheet Set. A fun owl and flower print is adorably displayed on this exceptionally soft comforter and sham. A sheet set perfectly complements the comforter with printed white daisies for a charming touch. Made from ultra-soft microfiber, this complete bed and sheet set is machine washable for easy care. 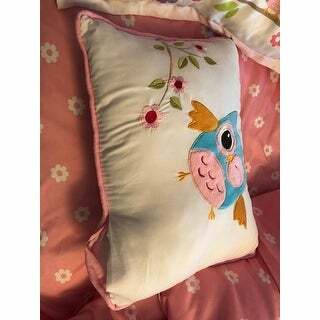 A decorative pillow with a plush owl applique provides the finish touches for a warm and cheerful look. I can't say a bad thing about this comforter set. I love that it comes complete with a matching fitted sheet, flat sheet and 2 pillowcases. The comforter is a good quality and washed well. The decorative pillow is cute and spot clean only, like many others. The colors are just as shown in the picture. Such a cute design. This bedding is very flat, not gonna last long. The sheet set that was included are not the best material. They look cheap too. It's too bad its a cute design. Looks great in my daughters room and seems to be good quality so far! Very happy with this purchase! My 2 y/o loves the owl set on her big girl bed and I love how cute the set is. Definitely something we'll be keeping for a long time. Bought this for my 3yo and her new, big girl twin size bed (I also bought the canopy bed on Overstock). This set more than exceeded my expectations. Three year olds are gross. Boogers, vomit, spilled chocolate milk, rogue makeup hoarding... these end up in the bed. It needs to be needing that isn't just attractive, but comfortable, soft, breathable, and EASY TO WASH. When this arrived I threw everything but the throw pillow into the wash on cold and ran it full cycle on Bedding, dried it on Normal, and had it on the bed within an hour! She loves it and it is so cute. My daughter loves her big girl bedding. Very soft material. Sheets are a little slippery (as most polyester sheets are) Wish there was a bed skirt with the set. Comforter is light weight and soft. Love the decorative pillow. Very cute 'big girl' bed! This bed set was the perfect addition to my little girl's room. We converted her to a big girl bed but didn't want to have to change room color, rug and curtains. This bedding keeps all the pink, green and blue currently in her room pulled together and even adds her favorite color Purple for any future changes to her room. Colors were exactly as the look in the picture. The pillow shams are a little thin so if your pillows are not white you will need pillow covers. Our pillows have blue stripes and they show through, but pillow covers will easily solve that. 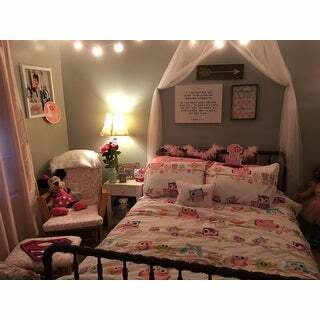 First, I love the design of this set, it matches my daughters room perfectly. However the set in its entirety is not well made. Sheets: First, they are synthetic and the pattern is only on one side, they are also paper thin, so thin that I feel as I might rip them every time I make the bed. Comforter: Also very thin, I am ok with the weight of the comforter but I am confident that it will NOT hold up if it is washed. We have been using it for a few months and about a month in a huge tear developed on the seam. Throw pillow: Very cute, but again, after only a few months of use, a huge tear developed on the seam. Giving the set 3 stars as I really like the pattern and light weight of the comforter. We love Mi Zone Kids and my granddaughter loves her bed! We bought one in full size and twin size for her white bunk bed and she's so happy. She loves pink and she loves flowers. I love the owls. My daughter loves owls. This bedding has lasted her for three years now. It washes good and has held it's shape. It also came with a cute owl pillow that adds some extra owl love. If you are undecided and need some persuasion then you are reading the right review. The piece is as nice as it looks on the photo. It’s soft and subtle, and the comforter is not heavy. My daughter loves the way it feels and I love the way it look. the quilt as well as the sheets were very soft to the touch nice quality and washed very well, the bed was finally put all together and its her first night sleeping in her gorgeous room. Thank you. This set was a great value for the price, and is better looking than I thought it would be. Little girls and teenage girls will love this set! My daughter loves her owl bed! Seems to be good quality and it is very cute! I love that it comes with matching sheets and the decorative pillow. The colors are very appealing. This seems a bit flimsy. The colors are pretty and there's no smell. Nice quality and seems to be holding up nicely, very bright and cheerful! We have been looking for this bedding everywhere!! I’ve had my eye on it for over a year and then when I went to buy it everyone selling it had jacked up the price to nearly $ for a twin!! Overstocks twin was out of stock until recently when it became available again and we are definitely not disappointed with our purchase!! "I need this in twin. I thought it came in twin. Actually, I thought I ordered it in twin and it did not arrive. Lisa Marie"
I ordered and received it in twin around Christmas and need it in full instead!
" Does owe pictures that are behind the bed are they for sale to "
"Is there a matching bed skirt?" No, this doesn't come with a matching bed skirt and there isn't one available to my knowledge. I purchased a white ruffles bed skirt from Overstock and it matches great. No, there is not a skirt. "When will the queen set be available?" "I want to buy two comforter sets but want to send them straight to my grandchildren and I cannot find out how to do this"
When you order, there is aplace for billing address and shipping address. Enter your grandchilds address in the shipping info. I got this for my granddaughter, had it shipped to her and it is a very good quality and she loves it. Where do I find out what is included in the "Complete Bed and Sheet Set"? Are the appliques for sale? Is the sheet set the pink and one one in the photo? "Will the twin set become available soon?" The twin set is currently available. "Is the comforter reversible to a solid pink? Thanks!" No. It is a very soft, beautiful comforter tho. Love it. Yes, but it looks funny that way. It looks cute folded down.